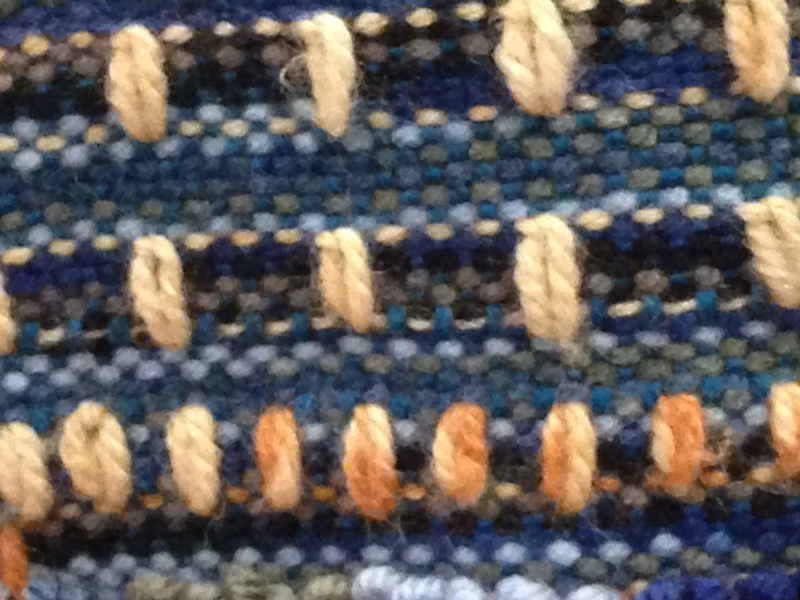 I am really enjoying my Cricket Rigid Heddle Loom! 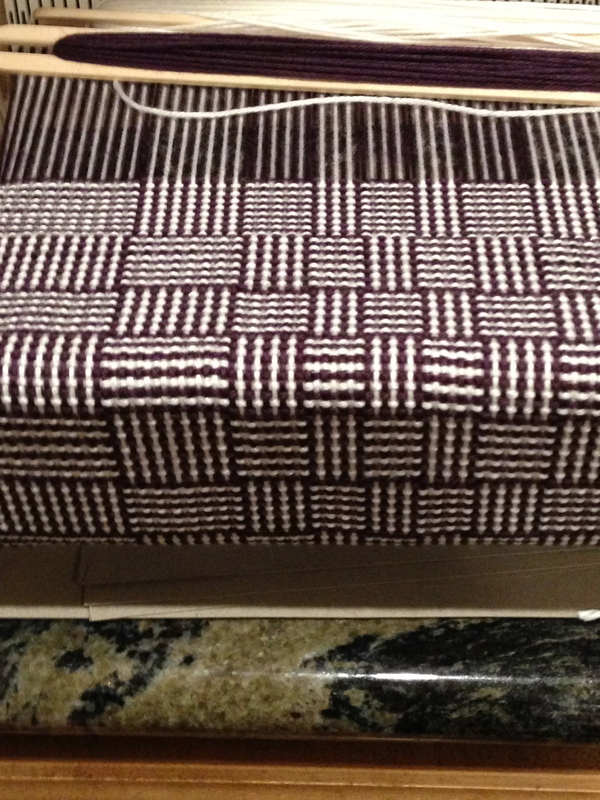 I have been learning some new things such as this Log Cabin pattern. After a few false starts, I seem to have gotten the hang of it! I also warped up for this fluffy scarf. I have quite a few of these Cricket Rigid Heddle looms that I purchased for teaching my summer camps and it is becoming increasingly difficult not to warp them all up with different projects!! 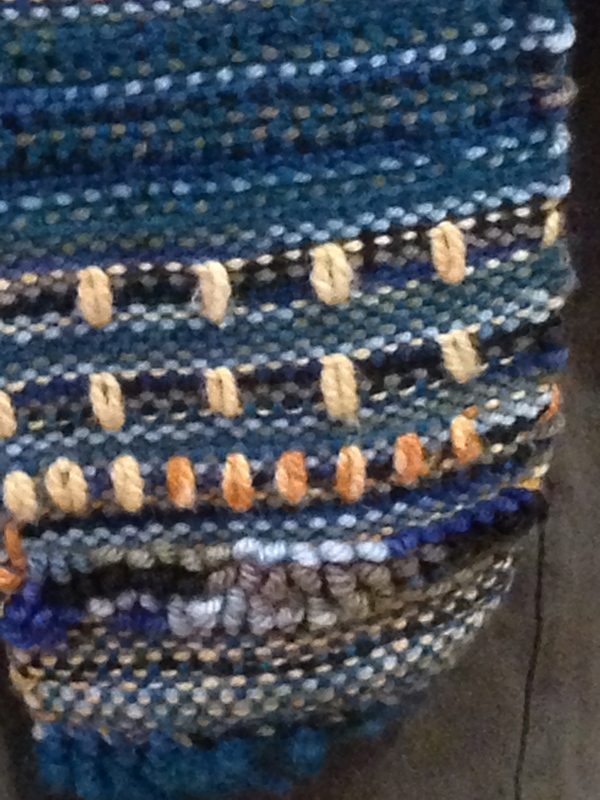 I finally finished the sample scarf that I started last summer to get ready to teach weaving camp. 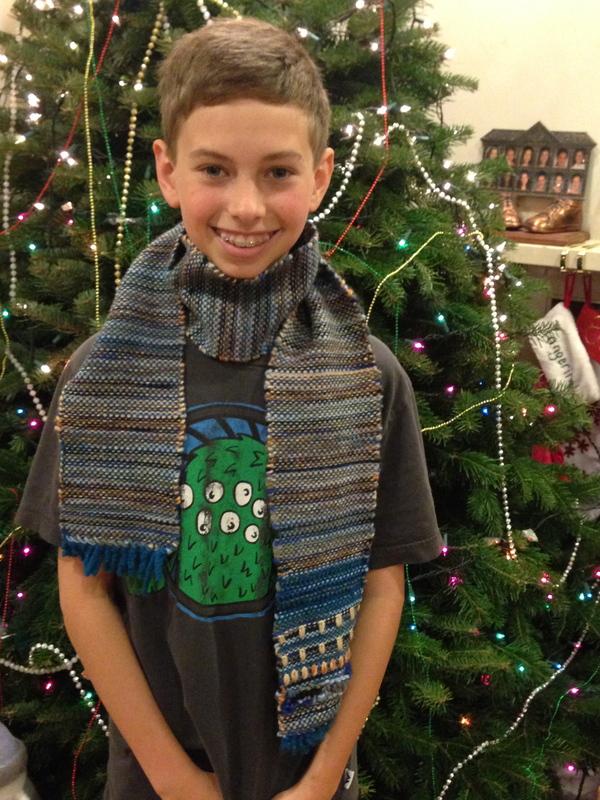 This was such a fun scarf to weave and I found the cricket loom to be very easy to use. 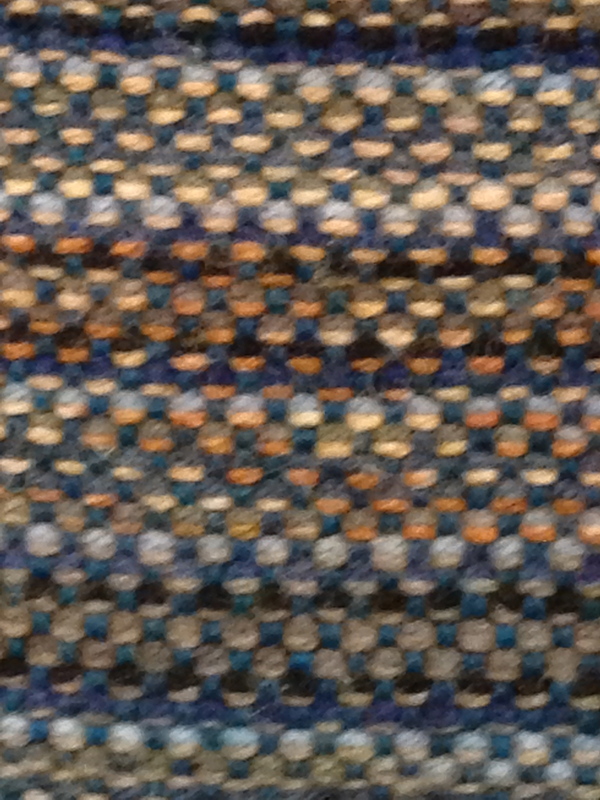 I wove even weave first with two different colors and I really like the effect. 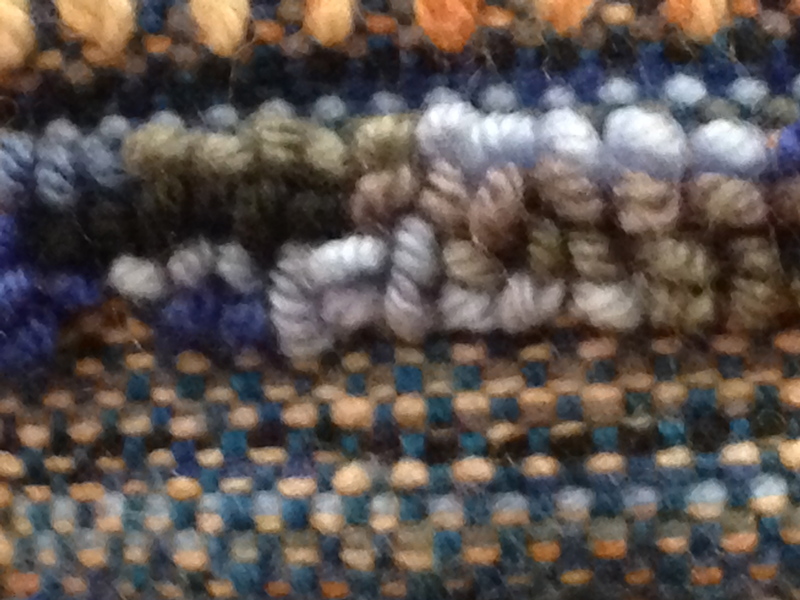 Then I tried this Loop Pile stitch from the book “The Weaver’s Idea Book” by Jane Patrick. It is a really fun stitch, but I am worried that with lots of use, this might pull out. This was also a very fun stitch called Danish Medallions. It is a little fussy and takes a bit of time, but I love the way it looks and can see myself using this again. 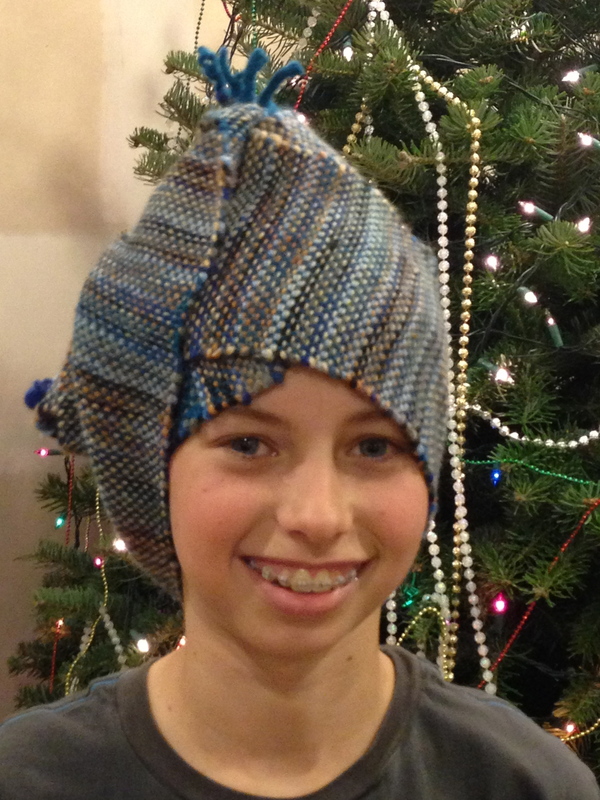 Of course my son thinks it looks good as a head wrap!! 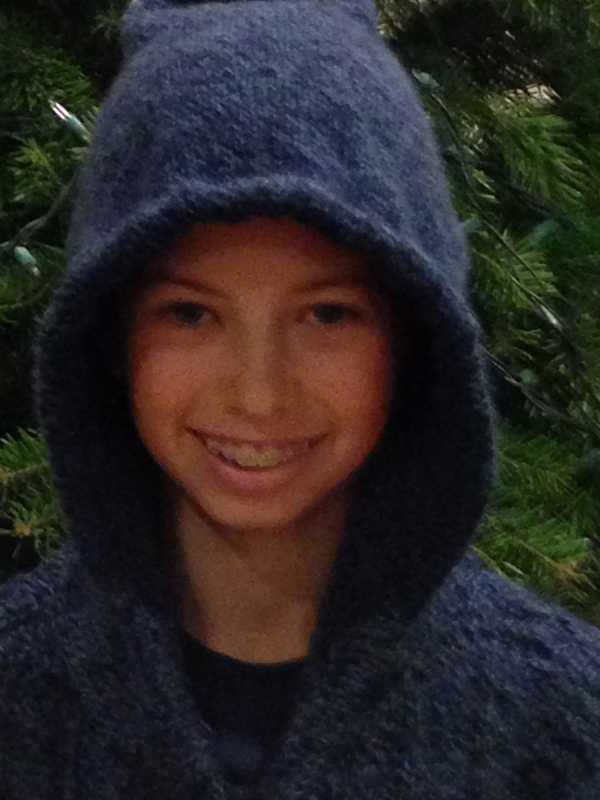 The boy’s sweater is finally finished!! 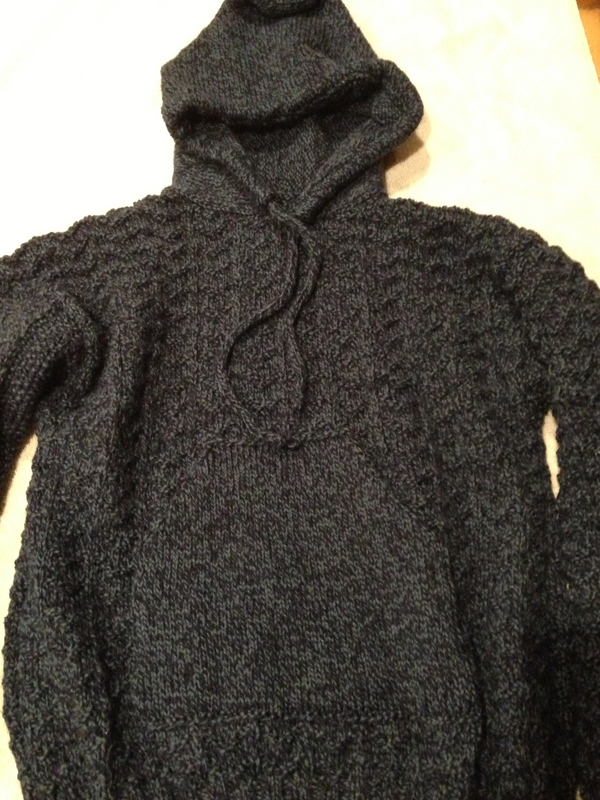 I finally finished this sweater yesterday morning before the kids woke up. As you can see, Ty did not want to wait one extra moment before he put it on. I’m so relieved it fits!!! Just the right length for him. 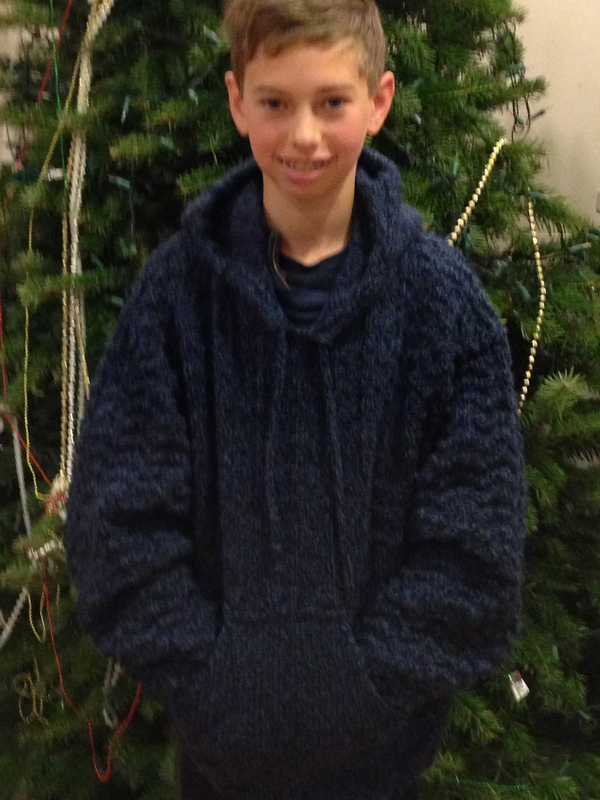 The sweater is longer than usual because Ty requested that it fall below his hips. 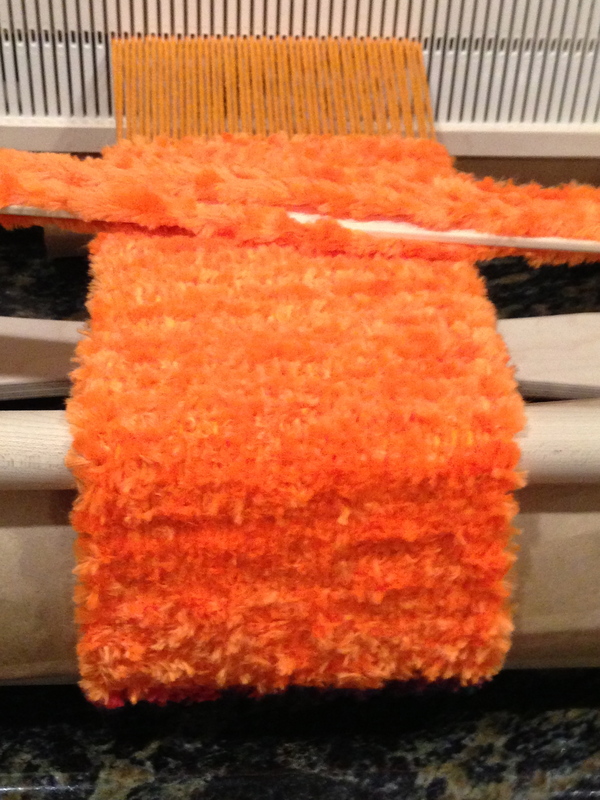 Just more knitting for me…. I had a lot of fun with this sweater. It is a 6 row repeat pattern and after awhile it gets very easy to remember. I knit both the front and the back at the same time on a circular needle – it only got a little complicated for the neck shaping. The sleeves were also knit at the same time. 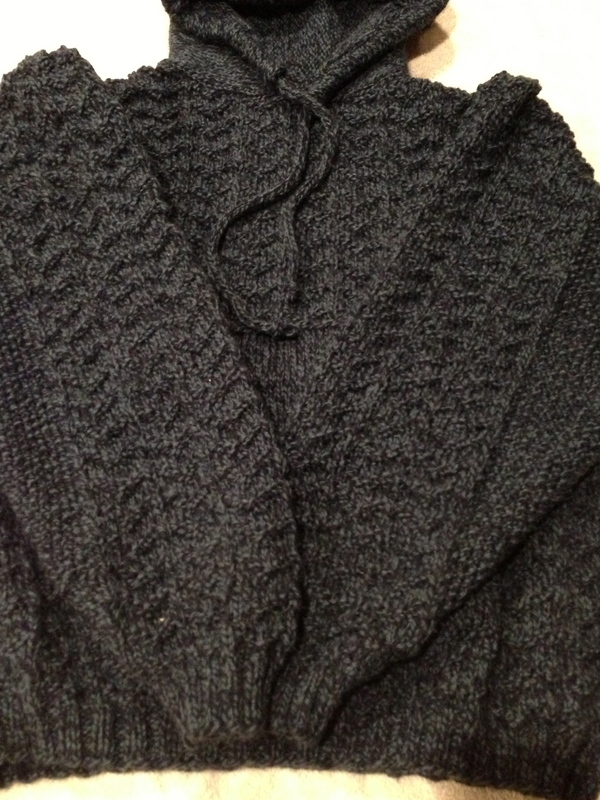 To me this feels faster than knitting them one at a time – once I cast off for the sleeves, both are done. For this sweater, I didn’t “continue in pattern” for the sleeve increases, I decided that I would add seed stitch to the mix. Ty loves the new stitch on his sleeves. 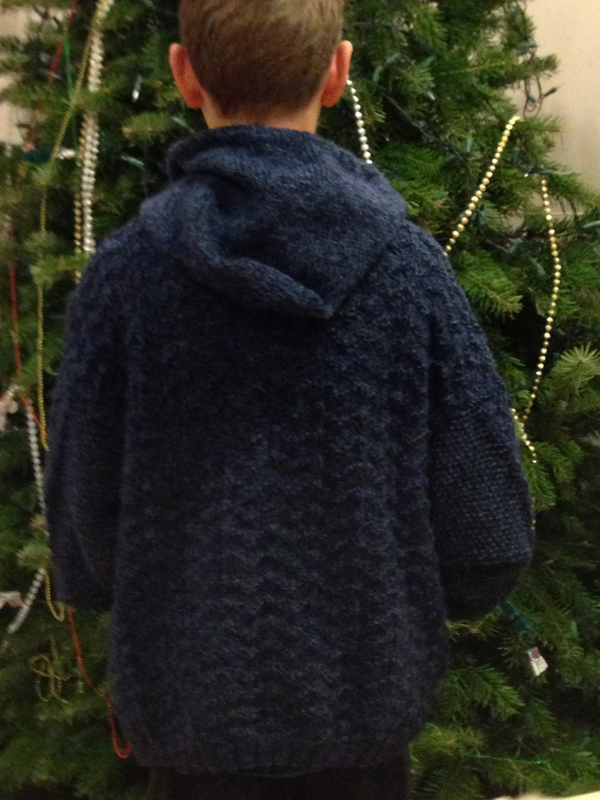 Originally, this pattern did not come with a pocket – but the boy wanted a pocket, so the boy got a pocket! It’s a good thing I like this pattern, I have requests for two more!! 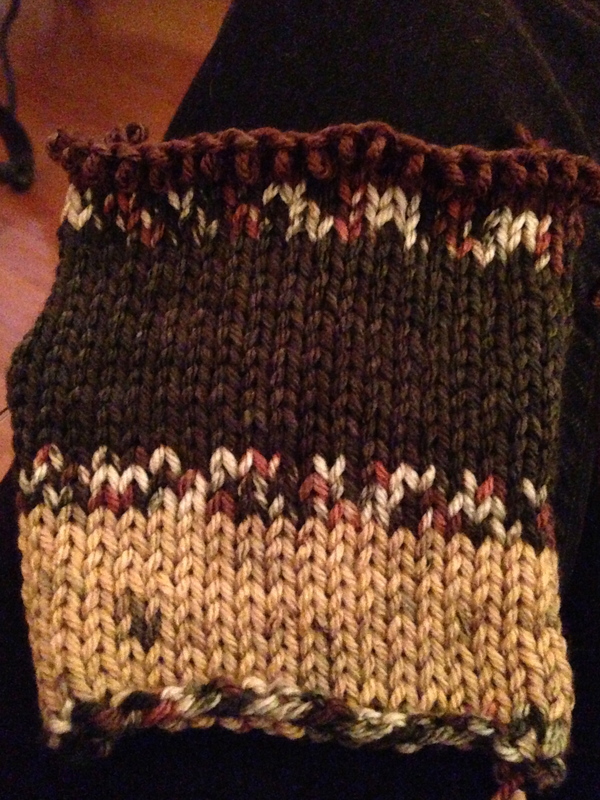 As soon as I had put the finishing touches on Ty’s sweater, it was time to knit a swatch for a vest that J wants. Gotta go, time to cast on and knit, knit, knit! 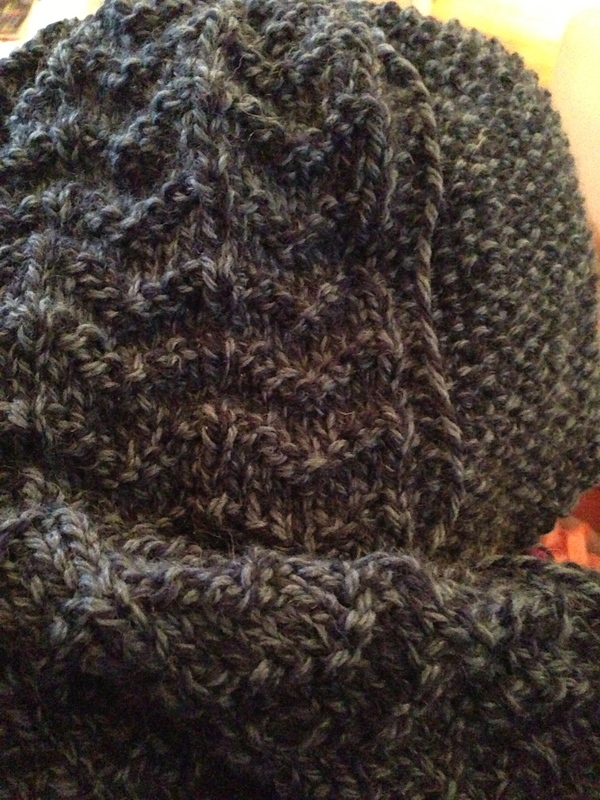 Yesterday, during E’s cello lesson, I sat relaxing and working on the sleeves to Ty’s sweater. They now measure 18 inches so I only have 3 more inches to go. 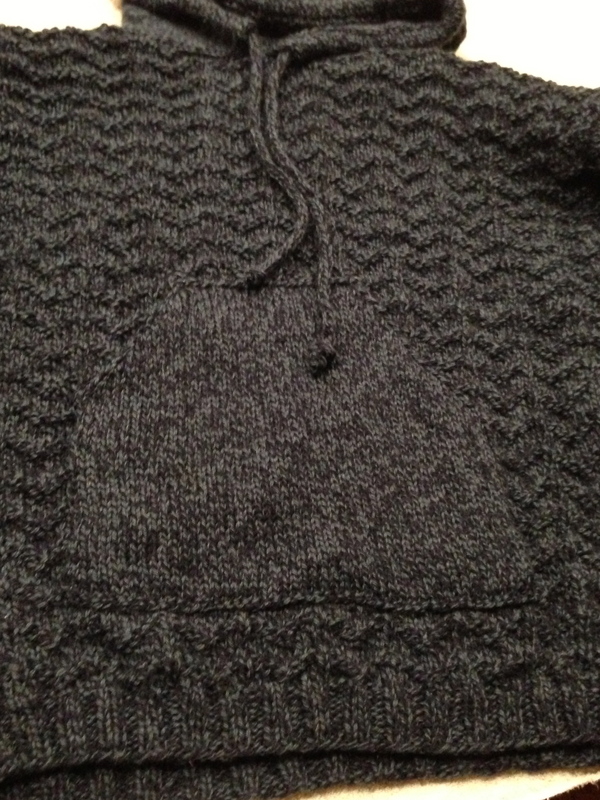 This sweater is well on it’s way to being finished. After a Thanksgiving that was very sad and not what any of us had envisioned, this was a somewhat welcome respite. The only positive that came out of this holiday this year was that we reconnected with family from afar – I really enjoyed our time with them and will make every effort to keep us all closer in the years to come.